Steinhoff’s mission is to give customers the opportunity to buy products that will add value to their lifestyle at prices they can afford.The group’s strategic focus is to strengthen its position as a global leader, supporting its brands to be the number one or two retailers in the markets they serve. Steinhoff Africa Retails vision for the consumer is “Provide everyday products at affordable prices at customers’ convenience”. FY 17 revenue figures not release due to ongoing investigation. Its acting Chief Executive Officer is Mr Van Der Merwe (Daniel Maree). The following list shows its top five shareholders and their respective holding equities and percentages. 1. Well established Supply Chain in place: Steinhoff International has a global footprint. 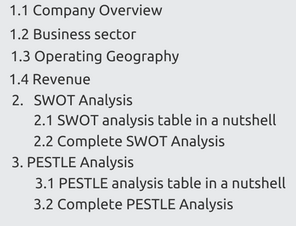 One of their strength is their well-established supply chain in place. Various specialists are divided into groups and these groups control and manage everything from raw material sourcing, manufacturing and product sourcing to shipping and delivery. Owning and managing such activities not only enhances the group’s ability to deliver goods but it also ensures that the products are provided at an affordable price. 3. Decentralized vertically integrated business model: Steinhoff has a decentralized and vertically integrated business model which provides significant influence over its entire supply chain. It includes control over production, sourcing, packing, distribution, manufacturing, etc. The in-depth knowledge and entire control gives Steinhoff power to compete in global discount markets and manage its costs effectively, thereby reducing costs and increasing margins. Steinhoff has around 9 million square meters retail space, 2.5 million square meters warehouse space, 4 million square meters property portfolio and 26 manufacturing facilities which aides in the vertical integration of its business model. 4. Preserved brand equity by keeping retail brands local: Steinhoff’s strategy of merger and acquisition helps them to expand into global market. Currently, the company has more than 40 local brands in 32 countries. The countries are spread in 4 continents which include Africa, Europe, North America and Asia-Pacific. However, to maintain the brand equity earned by the acquired company in the local market and to gain most out of the brand equity, Steinhoff does not change the names of acquired companies. This ensures that the company recognises the cultures of the local countries and communities and also makes the most out of these acquired companies. 1. Potential in Emerging Markets: Asian markets and Latin American are completely untapped by Steinhoff. It is yet to make entry into the Asian market and Latin American countries. Moreover, South Africa and others countries of BRICS have similar characteristics and the business model can be used expand in other BRICS nations as well. However, a lot will depend on how Steinhoff manages to get out of its current crises and hold the empire that it has created globally. 2. Predictive analytics for personalisation: Predictive Analysis is a method by which historical data of the business is studied to find out the business trends which can help foresee future emerging patterns which can help in taking decision for future course of action. In 2017 usage of Predictive analysis has become a trend. Another strategy which retailers use is ‘personalisation’. Personalization includes designing offers and promotions separately for each individual so that the customer returns to shop to the same company. Personalization helps in achieving customer loyalty, increased customer spending and time saving. In a recent survey by an analytics agency Adlucent; 46% of consumers feel personalize ads reduce irrelevant content and 25% of them feel it helps them purchase and discover new products. In the absence of personalization, companies risk losing customers to its competitors. Companies that use personalization in the retail space have seen a 19% rise in their sales, according to KPMG’s Global Consumer & Retail practice 2017 survey. Since this is a relatively new concept, investment in predictive analytics and personalization is an opportunity for Steinhoff to steer clear of its rivals before all the competitors join the analytics bandwagon. 3. Growing purchasing power in Europe: According to the GfK study the average European spending and saving is of €13,937 in 2017 which has increased by 1.9 percent. This indicates the tendency of Europeans to spend more. This comes at a point when the Europe was facing issues like Brexit, refuges crises, terrorism as well as tensions between Turkey and Russia. Central and Eastern European countries nations had the highest purchasing power increase in Europe. More purchasing will mean consumers will have more money to spend which will result in higher spending on essential as well as luxury goods. Its European subsidiary has received a two year loan from the US hedge fund Davidson Kempner; due to which it shall now not have to rely on its parent company for working capital. Due to this their shares have risen by 82% in the first few trading days of 2018.Steinhoff’s European operations include Pepco and Poundland which too showed an increase of 5.6% in sales in Dec 2017. 1. Uncertain political climate: South Africa fell into recession for the 2nd time in 8 years in 2017. In 2015 droughts hit the country hard and it is still recovering from the aftermaths of the drought. However, the past government African National Congress (ANC), which has been ruling South Africa for 22 year, was in crises. The ongoing corruption and a sense of instability are leading to country’s credit rating cut where only 30% of businesses are feeling confident about the economy as of 2017. Policy implementation has been a problem since the political parties are fighting within itself. In such an uncertain political scenario, recession and war in other parts of Africa and the accounting scandal of Steinhoff will hit the company hard. Unfavourable political climate will further make it difficult for the company to make a swift recovery. 1. Jobs losses in South Africa: The South African Clothing and Textile Workers Union (SACTWU) fear that the accounting scandal of Steinhoff in South Africa will lead to job losses in the near future. Steinhoff has a very strong footprint in South Africa and with its share price falling by 90%, the Union is worried about the survival of the company and that it may lead to large number of job losses in the country. Steinhoff’s 130000 employees are amidst fear of job loss due to the troubles in the Company. The local trade Unions are concerned about the crash in the Company’s stock price and its repercussions on the employee pensions. However, lack of “fast, sustainable growth” could lead to the rise of unemployment by 30% over the next five years. SpecificImpact on Steinhoff? 2. Growing purchasing power in Europe: The purchasing power in Europe increased by 0.7% in 2016 i.e. Europeans had more power to purchase goods. This comes at a point when the Europe was facing issues like Brexit, refuges crises, terrorism as well as tensions between Turkey and Russia. Central and Eastern European countries nations had the highest purchasing power increase in Europe. More purchasing will mean consumers will have more money to spend which will result in higher spending on essential as well as luxury goods which will benefit Steinhoff. The top competitors in Steinhoff's competitive set are IKEA, Tempur Sealy, Serta, Select Number, Nature's Sleep, Simmons Bedding Company, Sleepy’s, Sterling Sleep, Benders Mattress, Sterling Sleep Systems and Art Van. Shoprite Food retail 2016 Acquisition Shoprite is a grocery retailer and Steinhoff a discount clothing retailer. This has increased their potential for rationalisation in areas of logistics, IT, back office systems and distribution. Steinhoff has 23% economic interest in it. Valuation is undisclosed. Mattress Firm Holding Corp Manufacturer 2016 Acquisition It is a $2.4 bn deal. Mattress Firm sells beddings, furniture, mattresses and other related accessories. It has a major 25% stake in US market. This has increased Steinhoff’s US business. Fantastic Holdings Ltd (FHL) Furniture Retailer 2016 Acquisition It is a $361 million deal with 100% stake in the company. This partnership has increased the sales and convenience of doing business in Australia. 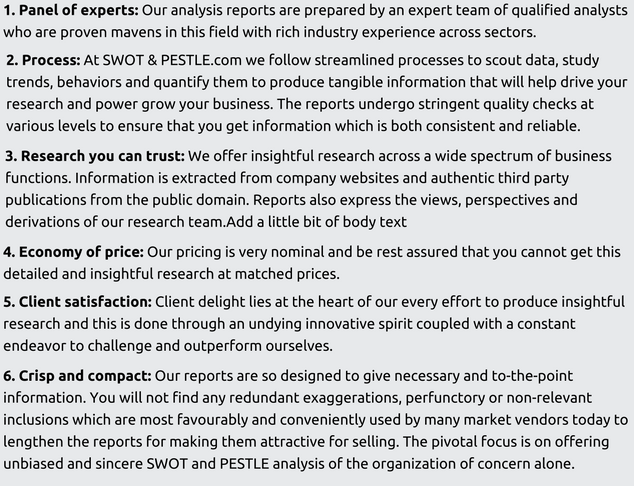 Steinhoff International SWOT and PESTLE analysis has been conducted by Aniket Deshpande and reviewed by senior analysts from Barakaat Consulting. 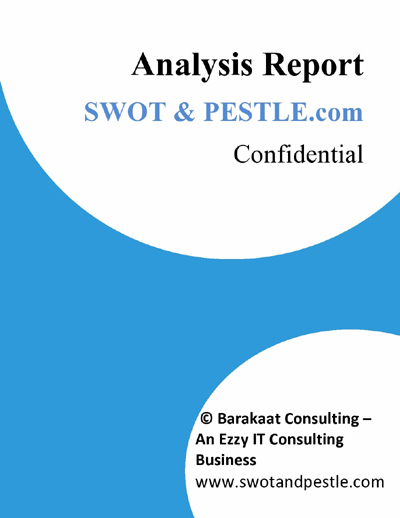 Copyright of Steinhoff International SWOT and PESTLE Analysis is the property of Barakaat Consulting. Please refer to the Terms and Conditions and Disclaimer for usage guidelines.